Today marks the first issue of Andy Diggle and Tony S. Daniel's ill-fated Action Comics arc, which will end in two months with #21. Diggle is off the title already, while Daniel will script and draw the rest of the story based on his outline, according to Daniel's own account. “For the remainder of the arc I’ll be working off his plots to finish out this first arc. So essentially, I become ‘scripter’ in the credits w/ Andy as ‘plotter.’ As for myself, I end my short run after I complete this first arc, which ends with issue 21. This was pre-planned since last fall as there is another project I’ll be taking on, and assisting with, a massive project with DC," Daniel wrote at the time. 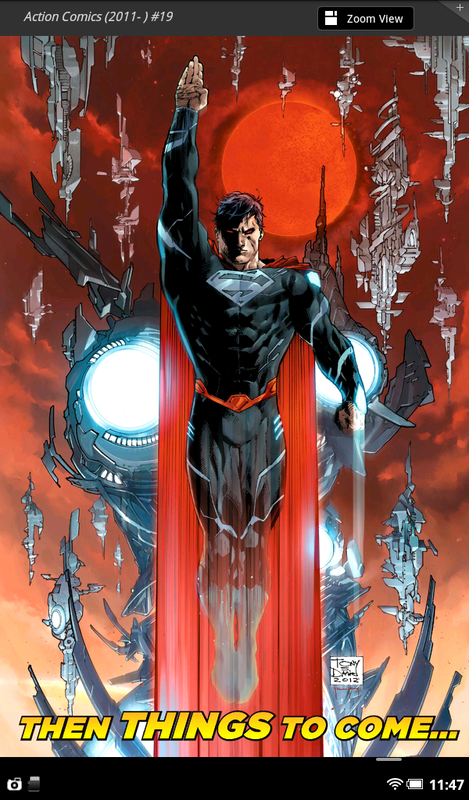 At the end of the story, though, is an ad for Action Comics #20 and #21...followed by a Daniel-drawn image of Superman in the black-and-silver version of his suit seen occasionally during Scott Lobdell's Superman run (notably in #0). The promotional image, as you can see, boasts "things to come." But will they? 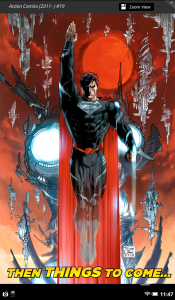 After all, if Daniel is off after #21, and it's certainly implied that this black costume story won't happen in the first three issues of his run, it seems as though the story being prominently advertised in the back of today's issue has likely already been scrapped before the issue featuring the ad even hits the stands. It's entirely possible that the full-page at shown at right may not be as misleading as it seems at first glance. If Daniel was always set to leave, it could be that this was a tease for the next major story, which he was never meant to be pencilling but which revealing in the back of the issue would tip the creative team for. Time will tell.